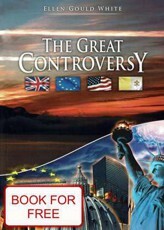 The book "The Great Controversy", written by the American author Ellen Gould White, is the last part of five-volume the “Conflict of the Ages” series, which describes the biblical events from the Creation to the final destruction of evil. This last part is especially actual for today. Everybody should read this book at least once a life. In the book "The Great Controversy" you will get to know about the history and beginnings of Christianity since the destruction of Jerusalem in A. D. 70, but also about the interesting historical facts about the reformers such as John Wycliffe, Jan Hus, Jerome, Luther and William Miller. You will get to know about the conflict between good and evil, which is happening on our planet, and what we can expect in the near future. Interesting facts about the getting of the false teachings into the Church and about the influence of the papacy on this world will maybe help you answer the questions about the many of Christian trends and disunity with Jesus' teachings. This book looks into the future by the helping of Bible text, so you can read about the events which we are still waiting.